I think I've posted the first paragraphs of all the books I am currently reading so this week I've decided to post one that I am going to be reading at the weekend for a challenge in one of the Goodreads groups that I'm in. 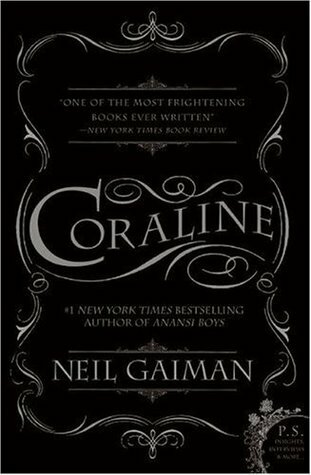 I will be reading Coraline by Neil Gaiman in a 24-hour read-a-thon challenge. I'm really excited about reading this book as Neil Gaiman is one of my favourite authors. It was a very old house - it had an attic under the roof and a cellar under the ground and an overgrown garden with huge old trees in it. There were other people who lived in the old house. Miss Spink and Miss Forcible lived inn the flat below Coraline's, on the ground floor. They were both old and round, and they lived in their flat with a number of ageing Highland terriers who had names like Hamish and Andrew and Jock. Once upon a time Miss Spink and Miss Forcible had been actresses, as Miss Spink told Coraline the first time she met her." I want to read it before I watch the film. Plus it's Neil Gaiman who I think is ace. Nice intro - I keep meaning to read Neil Gaiman!! I only started reading Neil Gaiman books last year but I have loved every book I've read and he has fast become one of my favourite authors. I tried reading The Ocean at the End of the Lane, by Gaiman, but did not care too much for his writing style. I know he is very popular, but this one might not be for me. I've heard others say they didn't like Oceans. And I don't think it's his best book so don't let it put you off him. I've never read Gaiman...not even Ocean at the End of the Lane! For some reason, it just never really grabbed me. Not sure about this intro - I think I would need more of a synopsis of the book before deciding. I have to say that this intro doesn't do it for me either. And I really want to read the book! I keep seeing Neil Gaiman books around. Now there is a film. I have never gotten around to reading his books. I might try with this one. Thanks for sharing. I have been wanting to read this for awhile now. I love Neil Gaiman's writing. He's so imaginative! I'm with you! I love his writing style and the worlds and characters he creates. I'm very quickly running out of his books to read! I can't believe I've never read any of Neil Gaiman's books! This sounds like a good place to start. I would recommend The Graveyard Book which I think was the first of his I read (or it might have been Neverwhere) and I enjoyed both of them immensely.